I do apologize for being gone so long again. I have been busy preparing for back to school which starts Monday. Yikes! Still so much to do. I do need your help with something though. My grandmother brought back some oregano from her village in Greece many, many years ago. It spreads like a weed but it's not invasive. And everyone in my family has patches of it growing all over their yards. The problem is that we've always referred to it as oregano but it doesn't look like any type of oregano I've seen anywhere else. It gets these cute little pinkish purple flowers scattered along the stem that produce an abundance of seeds which is why it shows up in the most surprising places each summer! 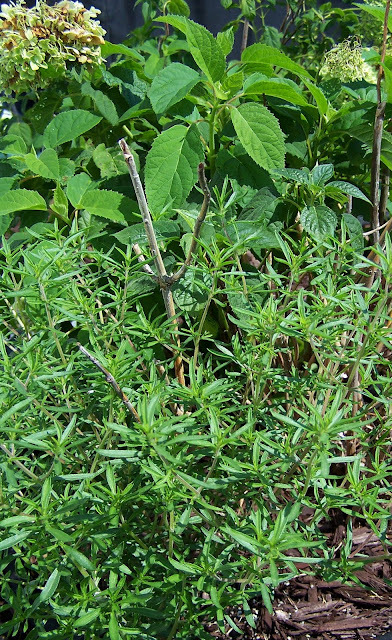 The leaves are long and thin which is not like an oregano leaf at all. So I am curious if this is really oregano. It sure smells like oregano. My yiayia called it oregano so everyone in my family refers to it as oregano too. And it really will grow anywhere. You can see it growing in the cracks between the bricks in my patio. It also showed up a good 15 feet away by the stairs on my patio too. ﻿and all the way around my house in the front yard growing out from between the cracks in the flagstone wall. It's just such a cute plant that I never yank them out. That way I'm always surprised where it will show up next year! But if anyone knows the identity of this herb I'd love to know. I am wondering if Liane from Prairie Garden can help at all with this one? I have sent a few pics off to my local organic gardening center. Patty is the best!!! We'll see what she says. Looks like my rosemary (that's in my herb garden). The leaves look nothing like my oregano. We'll see what Patty has to say. My cousin who owns a produce business also deals in herbs. He brought me the best oregano I ever had and the leaves were slender like this Greek variety. He can't remember it and thus hasn't ever gotten it again! It was divine. I used on pizza. I've had a couple of people suggest that it's rosemary. But I know it's not rosemary. I've grown rosemary before and my oregano's leaves are not succulent like rosemary leaves. Besides this herb will die after it flowers and then it goes to seed. It reminds me a little of rosemary but it's stems look less woody. Maybe there are lots of different kinds of oregano? I have seen so many versions of oregano I have no doubt it is oregano. Are you cooking with it? Oh thank you so much Liane! Yes we do cook with it and we use it fresh too. We also dry it and store it to use as well, just like any other type of oregano. yes, good luck going back to school. now, after all the comments i've read, i'm really curious. although it could very well be Greece's version of oregano. Okay so I am convinced that it is definitely oregano but an unusual variety possibly only found in the remote greek village my grandma was from. And I wish I could share some with all of you1 I definitely have way more than I will ever be able to use. I just came upon your site in an attempt to try and identify the exact same plant. My wife's parents come from the Central Italian province of Abruzzo (Eastern side of Italy, bordering on the Adriatic Sea). They've always had this same plant growing all over their yard/garden/patio/walkway, in Toronto, Ontario. They've always referred to it as oregano. It sure smells and tastes like oregano, but in searching the internet I've not seen any oregano with the same long thin leaves. 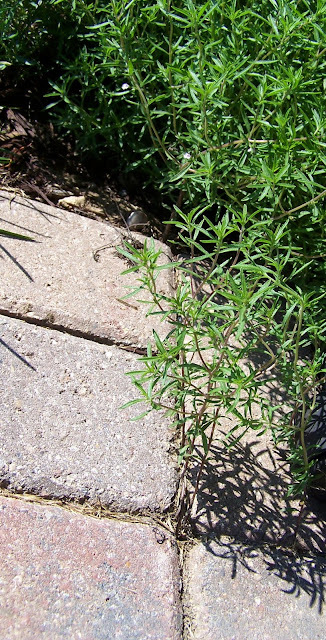 At first glance it may look like a miniature type of rosemary, but this is definitely not rosemary. My wife and I live in Brampton, Ontario (just west of Toronto) and we have it growing in our garden and walkway as well (thanks to transplants coming from my in-laws garden). I've even noticed this same plant growing in the cracked pavement of our neighbour's driveway, down at the end of our street. He calls it oregano too. I agree, it must be some variety of oregano, but I wish it could be identified. Hopefully, someone can put a name to this plant at some point. 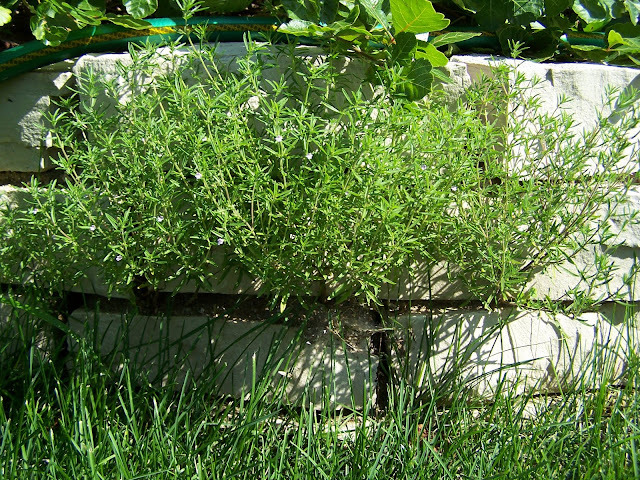 Glad to know I am not the only one with this kind of oregano. And you are right about it looking like rosemary at first glance. But the rosemary leaves are more succulent like lavender where the oregano isn't. I had so much of it in my yard this spring that I must've dug up two full size lawn bags of it to keep it from smothering my other plants. 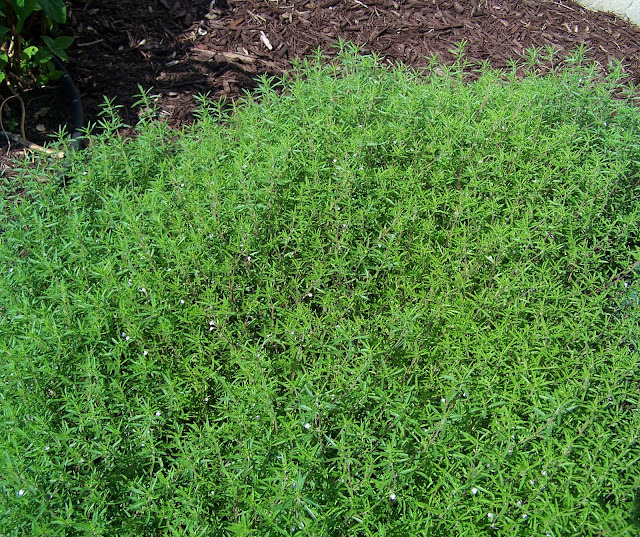 If you ever find out the name for this oregano let me know! The mystery is finally solved!! 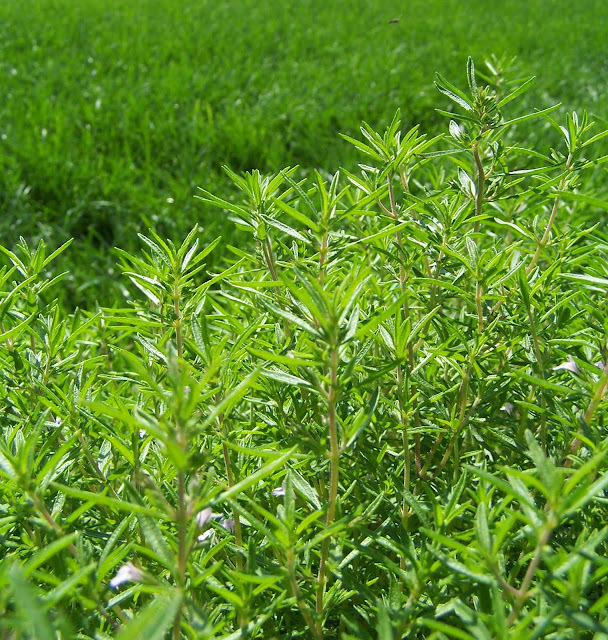 The plant is Summer Savory. In fact, there are two varieties of savory, both summer and winter, with the summer being a lot more aggressive in its growing habits. The International Herb Association recently held their annual conference here in Toronto, last June, and they actually named savory as the upcoming Herb of the Year for 2015. It is apparently very popular in the Canadian Maritime Provinces, especially Nova Scotia, where they use it in poultry stuffing instead of sage. This year, we've had a bumper crop come up in our rose bed, which made it easy for harvesting and adding as a garnish to our various al fresco dishes, especially pasta. Just Google Summer Savory for all the info. you ever needed. Oh my goodness Greg! You did it! Thank you so much for identifying my "oregano." Summer savory, who knew? I have never heard of that before but now I am going to have to send this info to my family members. I'm glad I was able to help out. 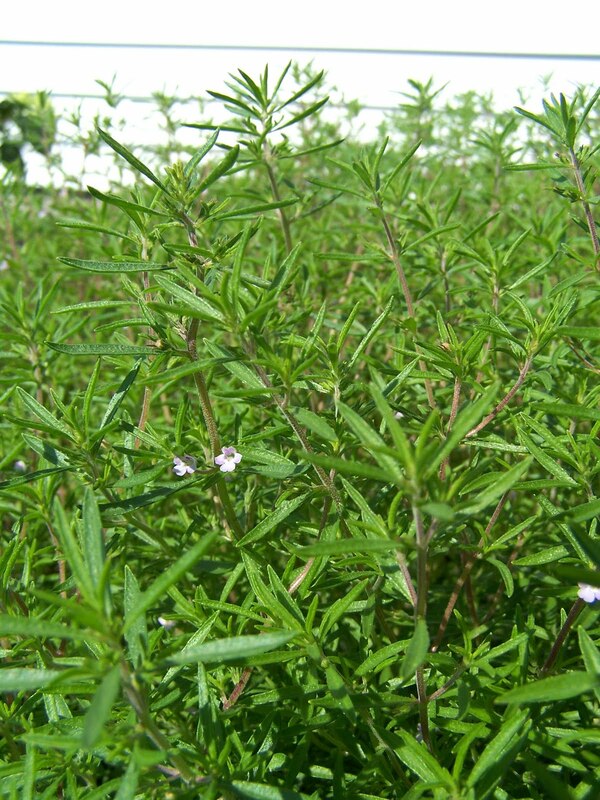 I found it very interesting that none of the articles I read on-line mentioned the definite similarity between the aroma and flavour of summer savory with oregano, especially dried oregano. My in-laws will no doubt continue to call it oregano.